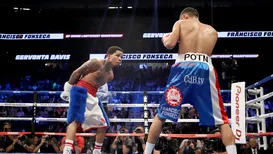 Don’t hold your breath on former junior lightweight champion Gervonta Davis taking on Vasyl Lomachenko any time soon. “[Davis] beat three undefeated fighters in a row. Now I don’t know no other fighters right now that’s beat three undefeated fighters in a row. And [Vasyl] Lomacheko — he can fight. He can fight. One thing we’re not gonna do is knock a guy that can fight. He can fight. “But the same way you give it is the same way you gotta be able to take it. Now we know that [Guillermo] Rigondeaux was extremely small. Extremely small. So my thing is this, with all these young fighters — ya’ll calling out ‘Oh we wanna fight Tank’…at the end of the day, guess what? Tank has a promoter. “There’s no rush. If ‘Bottom Rank’ is the top company in boxing…we gonna pull up the paydays of these different fighters from Top Rank and then I’ma show what these guys should be getting, why they underpaid. “I don’t take nothing away from Lomachenko. He better stop listening to his promoter…he’s been treating fighters bad for over 40 years. “As soon as I got away from Bob Arum I instantly started making crazy money. Instantly! “ … so if Lomachenko got $1.2 million and [Rigondeaux] got $400k, that’s $1.6M. Well, you know, I got fighters making that. So at the end of the day, I don’t got nothing against Lomachenko at all, I wish him nothing but the best. “But don’t ever let nobody put no battery in your back to pump you up to talk disrespectful about no fighter that’s with me — ’cause I’m not hiding nobody.